I am excited to announce the soon to be released Lumenier QAV250 Mini FPV Quadcopter airframe. With small yet fully functional FPV quadcopters having gained a lot of popularity recently, we decided to design a small FPV airframe that deserves the QAV label. The QAV250 is a symmetric 250mm size airframe that accommodates 5" props. The 250mm is measured motor shaft to motor shaft diagonally. Our airframe was designed to support a 3s lipo setup and powerful 2206 2000kv motors that will be released as the Lumenier FX-2206-13 2000kv. AUW: The QAV250 is flown with an AUW of around 530g (includes all flight electronics, FPV gear and Mobius HD camera). Fully loaded with FPV gear and Mobius HD cam, we get 7 1/2 minute hover time with a Lumenier 1300mah 3s lipo, 5x3 Gemfan props, and 12amp ESCs. Lipo had 3.6v per cell remaining. 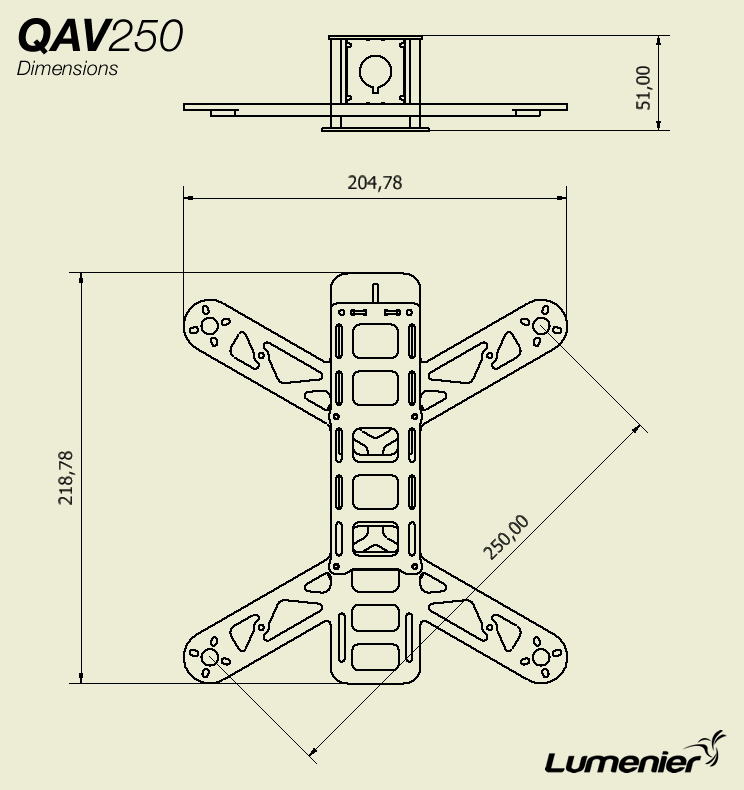 The QAV250 will go on pre-order in November and will ship before Christmas 2013. Retail price is still TBD. Last edited by timnilson; 2nd January 2014 at 09:59 PM. When will you guy´s start the pre order? Last edited by Traveller; 19th November 2013 at 02:26 PM. I know what you mean - I've actually started designing my own micro quad (just DIY for me) because I love the concept of a fully capable but small machine. Think this will do well! and after brushless gimbal mania now is the turn of mini quads. Great work Tim. Has this version the same dampening system such as bigger qav? Very cool! Will there be an option to choose what LED's you can buy? Imagine IR leds on that puppy for night flying in the garden! You'd just be peepin on some girls. Sssshht! They don't have to know!